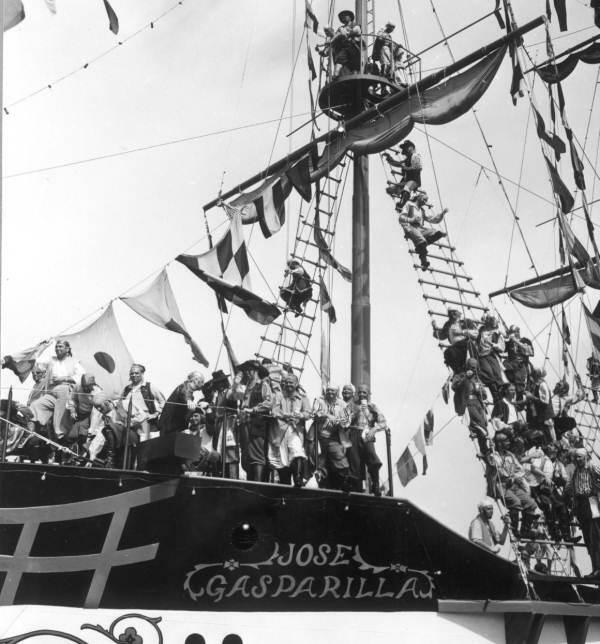 "Pirates" with Ye Mystic Krewe of Gasparilla really embrace their roles in the 1954 invasion. The Gasparilla parade in 1910 was the last year the invasion was done on horseback. The following year was the first invasion by boat. A flyer advertising the 1914 festival. 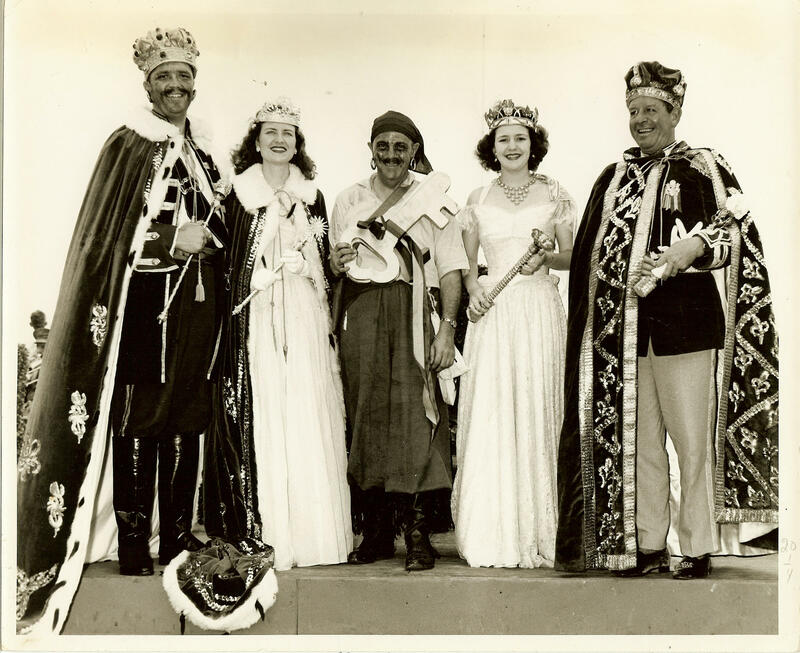 Former kings and queens of Gasparilla. Pirates have fired off canons on the Jose Gasparilla II as the ship "invades" Tampa Bay since it was built in 1954. Don't worry, there aren't actually any canon balls inside. Look closely and you can spot pirates on the Jose Gasparilla II in 1959 enjoying some adult beverages as they invade the city. Beauty contestants in a 1959 Gasparilla parade. Krewe of Venus was formed in 1966 and was the first krewe to allow women to join. Ye Loyal Krewe of Grace O'Malley formed in 1992 and was first all-female group. Tampa Mayor Bob Buckhorn meets with Ye Mystic Krewe of Gasparilla members in 2019 to "negotiate a peaceful surrender of the city," part of the tradition leading up to the annual Parade of Pirates. Pirates with Ye Mystic Krewe of Gasparilla fill up the 168-ft. Jose Gasparilla II for the annual invasion. Last year about 1,500 boats joined in on the invasion. Ye Mystic Krewe of Gasparilla was the first group to participate in the parade, but now there are dozens of other krewes joining in on the festivities. Gasparilla was heavily criticized in the early 1990s for being mostly white and male. Since then organizers have worked to diversify the festival and include more krewes for all races and genders. Like Mardi Gras in New Orleans, partying at Gasparilla can get pretty rowdy. But city leaders have made a lot of changes over the past decade to keep drinking under control. This week on Florida Matters, we take a deep dive into the past and present of Gasparilla. Learn about the history and traditions of Gasparilla on this week's Florida Matters. In the first portion of the show we speak with Rodney Kite-Powell, the Saunders Foundation Curator of History at the Tampa Bay History Center. 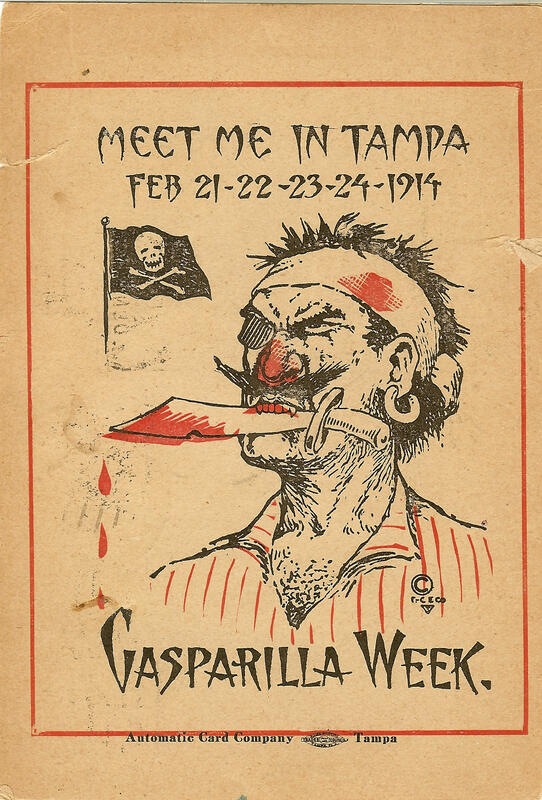 He tells us about the origins of Gasparilla, which Tampa first hosted in 1904. Then we meet Don Barnes, Executive Officer of Ye Mystic Krewe of Gasparilla, the group that helped found the festival. He talks about what goes into putting on the massive event and how it has expanded over the years. Louise Frances Dodge, who was society editor of the Tampa Tribune in 1904, came up with the idea for the festival with Tampa’s customs director George Hardee. They wanted to jazz up Tampa’s annual May Day celebration and decided to combine elements of a New Orleans Mardi Gras festival with new traditions inspired by legendary pirate Jose Gaspar. Stories about Gaspar say he terrorized Florida’s west coast during the 18th and 19th century. Though there is no evidence he actually existed, Gaspar was adopted “patron rogue” of this new Tampa celebration. Once they had the idea for Gasparilla, Louise Frances Dodge and George Hardee invited members of Tampa’s high society to form a secret group called Ye Mystic Krewe of Gasparilla. This krewe of “pirates” performed the first “invasion” in 1904, riding into Tampa’s May Day parade on horseback and throwing a big gala that evening. Rodney Kite-Powell said the first invasion was a huge success. He said it took a few years for the festival to become a consistently annual event, but that organizers quickly realized it could be an asset to the city. “It provided a new social outlet for Tampa’s middle and upper class,” he said. “Also, they saw pretty early on that this could be a neat attraction and a neat tourist draw to a city that didn’t really have much of a tourist industry aside from the Tampa Bay Hotel and the fact that the railroad did come here." Most modern-day Gasparilla attendees picture the large “Jose Gasparilla II” pirate ship that sails into Tampa Bay each year for the invasion, but that was not built until 1954. In the festival’s early years the invasion was done on horseback. The first invasion by boat was in 1911. Kite-Powell said it wasn’t always easy to pull off such an invasion by sea. Though there were plenty of boats in Tampa’s bustling port, pirates needed to find ships that were empty, which was difficult. “Sometimes the ships they found weren’t in great shape, so they would run aground,” he said. “There is actually one example of when a ship wasn’t totally empty of its cargo and that cargo was livestock – pigs and chickens. And a few pigs and chickens didn’t make it from one end of the invasion to the other." As the festival grew in size and splendor, so did its role in Tampa society. For most of the 20th century, Ye Mystic Krewe of Gasparilla, the only organization hosting the parade, was very exclusive. Taking inspiration from Mardi Gras krewes, there was a hierarchy in place with a “king and queen” of Gasparilla crowned each year and debutante balls for young women. For men, getting the chance to don a pirate costume and join the invasion could be a very valuable opportunity. “Certainly as Tampa was growing in the 1950s and ‘60s, there was a great desire among new businessmen in the area, particularly people who were new to the area, to become a part of either Ye Mystic Krewe or join Palma Ceia Country Club or Tampa Yacht Club, so you can become established in society, but also in business circles,” said Rodney Kite-Powell. Gasparilla faced controversy in the early 1990s for being a mostly white, male event. The parade was even cancelled in 1991 over disputes about diversity. Don Barnes, Executive Officer of Ye Mystic Krewe of Gasparilla said a lot has changed since then. “There are 65 different krewes, a lot of family-style krewes, mixed krewes as far as male-female, cultural – I think that we have everything you could possibly imagine and if we don’t, we’ll find room for it,” he said. Alcohol has long played a role in Gasparilla, as it has with Mardi Gras celebrations in New Orleans. Looking at old photos from past festivals, you can see pirates with drinks in their hands, and the Jose Gasparilla II used in modern invasions is essentially a floating bar. Attendees are welcome to drink openly along the parade route on Tampa’s Bayshore Boulevard and surrounding bars and restaurants are packed with people drinking from morning to night. But Barnes said things started to get out of hand and reached a low point around 2010, when the festival saw hundreds of arrests related to underage drinking and confrontations between drunk people. He said Gasparilla organizers have worked hard to combat that with efforts like ramping up police presence along the parade route, doing educational outreach and limiting the amount of alcohol people can bring and buy. “And as a result of some of those things, the police presence and the fact that we’ve restricted the amount of mixed drinks that you can just bring along the parade route, we’ve seen arrests go down to less than a dozen,” he said. “We’re not like Mardi Gras – we’re fun, people are having a great time – but it’s much safer and much smarter,” he said. Floats need to be in place on Bayshore Boulevard early Saturday morning for the Parade of Pirates to start at 2 p.m. Barnes said this year’s parade will have 114 floats. 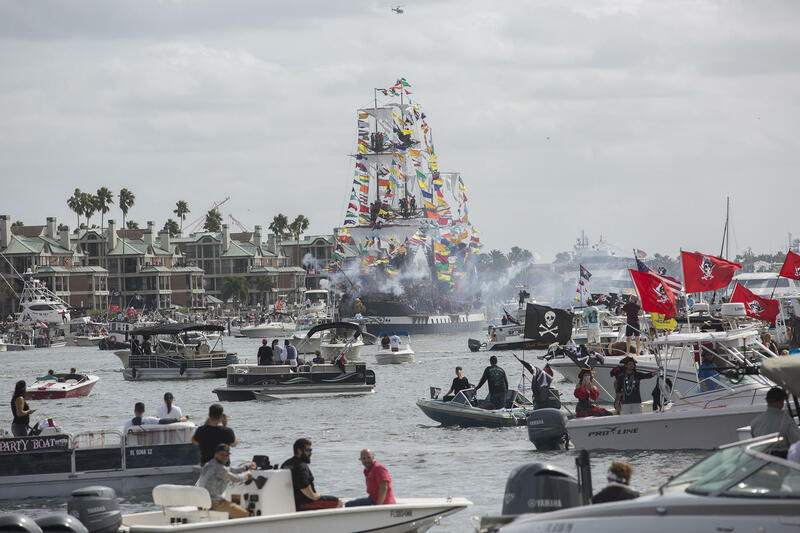 The pirate ship needs to be moved into place to begin the invasion at 11:30 a.m. Tugboats help move the ship, which leads a flotilla of over 1500 smaller boats. Pirates gather at the Tampa Yacht Club the morning of to get their costumes and makeup on and do media interviews ahead of the festival. Once the invasion begins, the boats need to arrive at the convention center within 90 minutes so the pirates can “confront the mayor” precisely at 1 p.m. He’ll “hopefully” hand over the key to the city so the parade can start and everything can wrap up by early evening. Despite the fact that he’s pretty much working the entire day, Barnes said Gasparilla is still fun for him. “Most importantly, if at the end of day, when I talk to the Tampa Police Department and the mayor’s office, (and they tell me) everybody got home safely, there weren’t significant numbers of incidents, people had a fun day and we showcased the rich, diverse culture of Tampa…I am just as happy as I could possibly be that we were able to pull off such an amazing event and that we’re able to do it year after year without significant incidents." Planning to attend Gasparilla this year? Check out our list of street closures, parking info, etc. so you can be prepared. NPR Tiny Desk Contest winners Tank and the Bangas from New Orleans are among the artists that will perform at the Gasparilla Music Festival at Curtis Hixon Park in Tampa next March.